We are proud to have been nominated for this year’s Supplier of the Year Award for Coles Supermarket under the Product Innovation and Quality Category. Arriving as finalists was made possible by our very own Additional Needs Trolley. This trolley was specifically tailored for customers shopping accompanied by their disabled child. 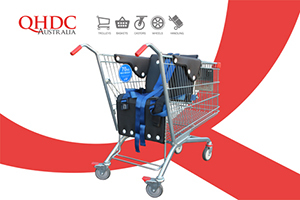 We take much pride being able to be a part of an innovative development project helping parents and children enjoy their shopping experience alike. QHDC is able to provide custom design and development services for a wide range of industries. Contact us to find out more. SMH is talking about us!